As we wrap up 2016, I’ve been reflective on how I lived my 2016 and how I want to live my 2017. 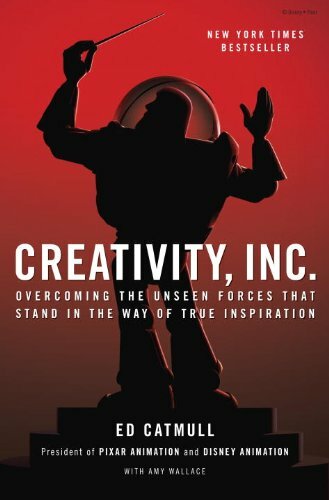 I found many nuggets of inspirations in Creative Inc. by Ed Catmull, co-founder of Pixar, on how to better manage people, organizations, and our work lives. He is an amazing storyteller and distilled many truths about creating and maintaining a creative, innovative, and inclusive culture. Many of these thoughts resonated a lot with me on a personal level as well. Here are nine notes of inspiration to be a better you in 2017. Many people ask, what is more important – people or ideas? Ed’s answer is: people, because ideas originate from people. Ideas do not self-generate. CREATE GREAT TEAMS FOR GREAT IDEAS: Give an idea to a mediocre team, and they will screw it up. Give a mediocre idea to a great team, and they will either fix it or come up with something better. If you get the team right, chances, are that they’ll get the ideas right. HIRE FOR POTENTIAL: When looking to hire people, give their potential to grow more weight than their current skill level. What they will be capable of tomorrow is more important than what they can do today. MAKE IT SAFE TO TAKE RISKS: It’s not the manager’s job to prevent risks. It is the manager’s job to make it safe to take them. We grow up striving to succeed. Success is equated with not failing. However, if we are always afraid to fail, we may not grow to become greater than who are now. Perhaps the real recipe to success is to make the cost of failure low, so we can fail often. That way, we can learn from them more easily and build something that we couldn’t have fathomed before. MEASURE PROBLEMS SOLVED NOT MISTAKES: The desire for everything to run smoothly is a false goal – it leads to measuring people by the mistakes they make rather than by their ability to solve problems. FAIL – TO DO SOMETHING NEW: Failure isn’t a necessary evil. It is a necessary consequence of doing something new. FIX ON THE CHEAP: The cost of preventing errors is often far greater than the cost of fixing them. We equate trust to not failing – like I trust you not to let me down. However, we are human and sometimes fail to live up to our promises. So trust in your family, your significant other, your friends, and your colleagues, mean that you trust them to do the best they can. If they screw up, you trust them to try their best to fix it. You trust them to be authentic and transparent with you. TRUST EVEN WHEN THEY SCREW UP: Trust doesn’t mean that you trust that someone won’t screw up – it means you trust them even when they do screw up. SHOW EARLY AND OFTEN: Don’t wait for things to be perfect before you share them with others. Show early and show often. It’ll be pretty when you get there, but it won’t be pretty along the way. And that’s as it should be. FIND BALANCE, NOT STABILITY: Do not accidentally make stability a goal. Balance is more important than stability. Do you agree with these points? Do you have others to add? Feel free to comment. SURPRISING COINCIDENCES: We tend to fail to understand how the basic laws of probability work and our selective attention, which lead to great surprise at many coincidences. Stunning coincidences are only natural — like stumbling into a close friend halfway around the world or meeting someone with the same birthday can be explained by simple mathematics. We also have selective attention — we notice and remember coincidences, but we hardly ever heed their absence. FAT TEMPTATION: Drop a bunch of kale into your cart and you’re more likely to head next to the ice cream or beer section. The more “virtuous” products you have in your basket, the stronger your temptation to succumb to vice. When shown a burger, their average guess was 734 calories; when shown the same burger alongside three celery sticks, the average guess dropped to 619. These are not rational calculations; they betray the shortcuts your brain takes in its running tally of vice and virtue. LIFE EXPECTANCY OF MUSICIANS BY GENRE: Musicians from the older genres – blues, jazz (including bebop and dixieland), country (including country and western, boogie woogie, honky tonk and bluegrass), and gospel (including spiritual and Christian rock) – enjoyed, on average, similar lifespans as those from the U.S. population with the same year of birth and gender. The next group – R&B (including doo wop and soul), pop, folk (including ballad and polka) and world music – had lower life expectancies compared with the U.S. population. AREA CODE STATUS: San Francisco, a city with no shortage of status symbols, has just gained another: the 415 area code. As with all status symbols in San Francisco and elsewhere, a 415 number can be yours, for a price. 415 was a “sizable market” even before the appearance of 628. But it’s not the most in-demand area code. “310” — Los Angeles — “right off the bat, are the hardest numbers to secure. People can’t get a 310, even a random 310 anymore.” Instead, they’re stuck with LA’s version of 628, 424. Nobody wants a 424, especially if they’re in business. Other popular area codes: 214 (Dallas), 312 (Chicago), 305 (Miami), 404 (Atlanta), 818 (Hollywood), and 626 (Pasadena). These are “original area codes. Most expensive number: 702 FORTUNE for $99,999. Most expensive ending digits -XXXX for $31,250. AVERAGE MIDLIFE CRISIS AT 42: Spotify found that there’s a specific point when middle-aged listeners drop their sophisticated singer-songwriters, their “best of the 80s, 90s and today,” and spontaneously start listening to teeny-bopper pop again. That age is — drumroll, please — 42. Too Much Music for my Muscles. Beethoven’s Favorite Key – E Flat. GETTING BUFF BUT GOING DEAF? High-intensity fitness classes are even noisier than they were a decade ago, with indoor cycling classes topping the list of culprits, blaring tunes as loud as 99 decibels. Adults can safely tolerate 85 decibels for up to eight hours. The human ear can handle 91 decibels for two hours, and 94 decibels for just one hour. A sign that it’s too loud: You experience ringing in your ears — tinnitus — after you’ve stepped out of the gym. You might also have temporary hearing loss. Composers Favorite Keys of Classical Music: Beethoven, Haydn, and Mozart all show strong preferences for a specific key. Haydn and Mozart most frequently wrote in major keys. All three composers whose most-used key was minor were from the Romantic era (perhaps they were sad about the Industrial Revolution). Rachmaninoff was the only composer to produce more pieces in minor keys than major keys. The least used key across the board was g# minor, with Brahms using it most (in only 1.5% of his compositions).